Stephen will summarise the main findings about the impact of charging, explaining the complexity and diversity of the picture around charging for admissions by museums. Two museums that have changed their charging policy recently will outline their experience. Finally, Stephen will summarise the key lessons for museums to consider when reviewing their own charging position. Digwyddiad di-dâl i aelodau AIM. Mae croeso i aelodau AIM fynychu’r naill ddigwyddiad neu’r llall, neu’r ddau ddigwyddiad ac i fwynhau cinio gyda chyfleoedd rhwydweithio ychwanegol. Cyflwyniad i Adroddiad Ymchwil Mynediadau AIM gan Dr Matthew Tanner, Dirprwy Gadeirydd Cymdeithas yr Amgueddfeydd Annibynnol. 11.45: Cyflwyniad adroddiad gan Dr Stephen Connolly o DC Research gydag astudiaethau achos o ddwy amgueddfa sydd yn cyfranogi. Bydd Stephen yn crynhoi’r prif gasgliadau am effaith codi tâl, gan egluro cymhlethdod ac amrywiaeth y darlun o gwmpas codi tâl ar gyfer mynediad i amgueddfeydd. Bydd dwy amgueddfa sydd wedi newid eu polisi codi tâl yn ddiweddar yn amlinellu eu profiad. Yn olaf, bydd Stephen yn crynhoi’r gwersi allweddol i amgueddfeydd eu hystyried wrth adolygu eu safbwynt codi tâl eu hunain. The first annual VisitorVerdict Members Forum will take place on 11 July at BMA House, Tavistock Square in London and will celebrate the widespread commitment to measuring and benchmarking museum visitor experience. The Members Forum offers subscribing museums the opportunity to ensure they get the most from the service. BDRC, with the support of the Association of Independent Museums (AIM), are hosting the event which will include a mixture of talks, tutorials, insights and networking. VisitorVerdict Awards will be also announced over lunch to recognise some of the great work happening country-wide. This is an invitation only event for current VisitorVerdict subscribers, but museums signing up to the service between now and early July will also have the opportunity to attend for free. VisitorVerdict is now the UK’s foremost visitor survey and benchmarking service for small/medium sized visitor attractions and museums are using VisitorVerdict to prioritise investment, improve visitor experience, inform marketing messages and media, for staff and volunteer training, contractor briefing and to attract and retain sponsors and investors. Our colleagues at BDRC (who many will know as AIM’s partner in delivering Visitor Verdict) have been working on a challenge for 2014 – trying to visit 100 attractions and tweet and blog about their experiences. They have given us permission to share their latest blog with you. You can read more of their insights on their blog, BDRC Stories. This article is packed full of the different ways that museums provide visitors with ‘Things To Do’ (not just for children!) and why it’s so important. “It was just stuff in glass cages” – The importance of Things To Do at attractions. Tourism, Travel & Leisure team Associate Director at BDRC Continental. In April this year, we embarked on the #visit100 challenge – a quest to visit 100 unique venues, exhibitions and events across the UK, taking a flattering selfie at each. Aside from perfecting the selfie (a skill few of us have managed), the main aim of #visit100 is to add granularity to our findings from the ALVA Visitor Experience Benchmarking Survey. A consistent driver of a positive experience in our ALVA work is ‘what there is to do’ at a venue. The presentation of objects with written interpretation is sufficient for specialists (the ALVA [and Visitor Verdict] ‘topic interest’ segment), but expectations are much higher for ‘tick box’ or ‘broadening horizons’ visitors, particularly those who are new to the subject area. The desire for ‘things to do’ is in part driven by the availability or ‘democratisation’ of knowledge via the internet and the technology that supports it. Cultural venues are no longer the main custodians of the information they exhibit. One of my first #visit100 trips was to Flamsteed House in Royal Observatory Greenwich. Between Herons Quay and Mudchute on the DLR, I had processed (although not remembered) enough information about Sir Christopher Wren to use it as a specialist subject on Mastermind. Wind back ten years, and this would not have been possible. Modern-day visitor are equipped with far more knowledge, or at the very least know that they can easily access it should they want to. The internet – via the rise of social media – has also acted as a catalyst for FOMO (Fear of Missing Out). Facebook check-ins and photo uploads allow us to shape how we are seen (our personal brand), and create a desire for our friends or followers to be seen similarly. Through creating and promoting tick-box experiences, attractions are in a great position to harness FOMO. You only need to look at the queue of people waiting by the Meridian Line (even though the actual line extends into the park below) to see FOMO’s power. The recession has also played a part in driving this shift. VisitEngland’s report on domestic leisure trends for the next decade talks about Cultural Capital – a movement away from transactional experiences to learning new skills. Trendswatch by the American Alliance of Museums makes a similar point. Venues continue to be presented in multi-sensory ways, opening the door to a more immersive experience. ‘The Rain Room’ at the Barbican and ‘David Bowie is’ at the V&A are great examples of how this can be done using technology. Sensing Spaces at the Royal Academy demonstrated how it can be done using the sights and smells of nature. Our #visit100 experiences have revealed lots of good examples of ‘things to do’. At National Trust’s Baddesley Clinton, our director’s children got dressed up in period clothes (although he didn’t). At Thinktank Birmingham, the Science Garden taught me about science in hands-on ways that school failed to and the internet never could. But ‘things to do’ isn’t just for children, and it doesn’t have to be too interactive. The British Library’s Comics Unmasked exhibition invited visitors to sketch their own comics, and entries were put on the wall. Down the road, The Wellcome Collection’s A to Z of the Human Condition sought entries for each letter of the alphabet – onsite and online. Another installation in Sensing Spaces was made solely of plastic piping that visitors had created themselves. At the National Gallery, visitors are invited to take a photo mimicking the subjects of the artwork they are standing next to. So should all venues be packed with things to do? Well, given their importance in driving a positive visit, it’s a good place to start. But ‘things to do’ is just one way of generating deeper engagement. During my #visit100 travels, two guided tours developed my understanding of impressionism (at National Gallery) and encouraged me to buy a print (at Tate). Staff interaction taught me what fur is on the Queen’s crown at the Tower of London (it’s stoat) and the whole of Queen Victoria’s family tree at Kensington Palace. The key challenge is to get people to think about objects or exhibits, to help them understand their context. It’s about telling stories, taking visitors back in time, delving beyond the case (or ‘cage’ as one focus group respondent put it) that they are stored in. BDRC’s Tourism, Culture and Leisure sector research team have been taking selfies on their travels to visitor attractions in 2014 – view them all here #Visit100. With over 200 museums now taking part in AIM Visitor Verdict – a free visitor research and benchmarking programme – we thought now would be a good time to share some top tips for making collecting visitors’ email addresses as easy as possible. You don’t have to bring up the survey at the beginning of a visit, when you probably have a lot of other things to say. Visitors tend to be more relaxed later on in their visit so this could be a good time to ask. Pick a point where the majority of your visitors will pass. Approach visitors on different days of the week and at different times throughout the day. Include school holidays and term-time and both normal opening and event days. You only need to collect one e-mail per group of people visiting together (remember this person must be 16yrs+). 5. The more the better! Most visitors are pleased to give feedback and are used to giving out their e-mail addresses so be confident in asking. The more feedback you get, the more confident you can be in your results. Ask visitors whether they’ve had a good visit when you approach them to participate in the survey, their experience of being asked is all part of their visit! E-mail addresses are easy to get wrong. Don’t waste your efforts: be sure to record e-mails carefully. Enter e-mails directly into the system. Use the ‘Add a Visit’ tool to add them one-by-one or collect them electronically in a spreadsheet and upload them all in one go using the ‘Upload Tool’. Help staff and volunteers to understand why the research is important and how it’s helping. This should make them feel happier asking visitors to take part. Share results with your team and keep them updated on how things are going. These tips have been compiled with suggestions and feedback from our recent workshop with AIM Visitor Verdict members. For more tips from the workshop click here. Visit England has recently published the official visitor attraction figures for 2013. Whilst the overall 4% rise in visitor figures for museums is to be welcomed, it is not as strong as the 5% rise across attractions as a whole. A look at the detail of the report sheds some interesting light on these figures. Overall there was a +5% annual increase in in total visits to attractions in 2013, representing a strong recovery following the -1% decline reported in 2012. This increase was driven by a recovery in visits to attractions charging for admission, where there was growth of +7%, following the -3% decline observed in 2012. Visits to free attractions grew by +3%. Despite being more likely to be closed seasonally in 2013, historic attractions experienced strong growth, historic houses/castles increasing visits by +7% and other historic properties by +10%. Visits to this sector are now around a quarter higher than they were in 2008. Revenues from admissions rose by 5%, attributed to a 4% rise in prices and the increase in visitor numbers. The percentage of attractions increasing their spend on marketing rose for the first time in eight years. 18% now offer some form of mobile app and 21% offer online booking. Facebook and twitter are now used widely by even small attractions, corresponding with the findings from AIM’s Visitor Verdict benchmarking, although use of mobile apps is much lower amongst museums and galleries (8%) than for many other types of attractions. Larger attractions with more than 50,000 visitors have seen the highest rates of increase. Smaller attractions (fewer than 20,000 visits p.a.) have grown at the slowest rate. Schoolchildren admissions also saw a strong increase in 2013. Although increasing at a rate lower than admissions as a whole (+4%), this was a notable turnaround on the -16% decline observed in 2012. Overseas visits increased for almost all types of attractions and in all English regions apart from the South West. However it was driven by free attractions, primarily by the national museums. Other than country parks and gardens, all attraction categories reported 2013 local visitor numbers up on 2012. The lower overall performance of attractions in terms of visit numbers in the North West and West Midlands appears to have been driven by declines in local visitors. These are the only two regions in which local visitor numbers fell in 2013. Local visitors appear to have driven the increase in visits to paid admission attractions in 2013. Local visitors to these attractions increased by +11% in 2013 compared with an overall +7% increase in visits to paid attractions. 41% of attractions charging admission, charge £5 or less for entry – a slight decline on the 43% observed in 2012. One in six charge over £10. The average entry charge stands at £7.30 in 2013. The average child admission charge amongst those sites charging is £5.18. A quarter of charging sites (23%) charge over £5 for child entry, with 6% now charging over £10.00. The average increase in adult admission fees is 4% this year – consistent with increases during the previous five years, with increases of 4% (2012), 5% (2011), 5% (2010), 4% (2009) and 5% (2008). The average increase for museums and galleries was 5%, giving an average charge of £4.41 and for ‘other historic properties’ the average increase was 7% giving an average charge of £5.38. Growth in visitor numbers was stronger for attractions that offered deals or discounts (offered by 61% of charging attractions), particularly in relation to chid admissions (the family market). However the impact on revenues was less noticeable between those offering deals/discounts (6% increase) and those that did not (5% increase). The report looks at the link between revenues, visitor numbers and marketing spend and notes that those attractions that increased their marketing spends saw bigger rises in both compared to those that did not. Heritage attractions appear to have driven the increase in full-time permanent staff, plus visitor / heritage centres and places of worship. Conversely, museums and art galleries, country parks, gardens, farms and workplaces continue to be more likely to be reducing these members of staff. Paid admission attractions have led the drive in taking on full-time permanent staff in 2013. It also notes a strong increase in volunteering in almost all types of attraction, paid and unpaid. The report also has information about regional variations, employment and volunteering and long-term trends in visitor numbers across different types of visitor attractions. One of the most interesting parts is the graphs on pages 14 and 16, showing the long-term visitor trends for different types of attractions. Museums and galleries have just out performed the market since 1989 but this is largely driven by the 150% increase in visits to national museums since free admission was introduced in 2001. Historic properties have under-performed the market since 1989 but since 2008 have seen very strong growth. Heritage Railways had been outperforming the market until 2011 but have since had two years of decline or stagnation in visitor numbers. 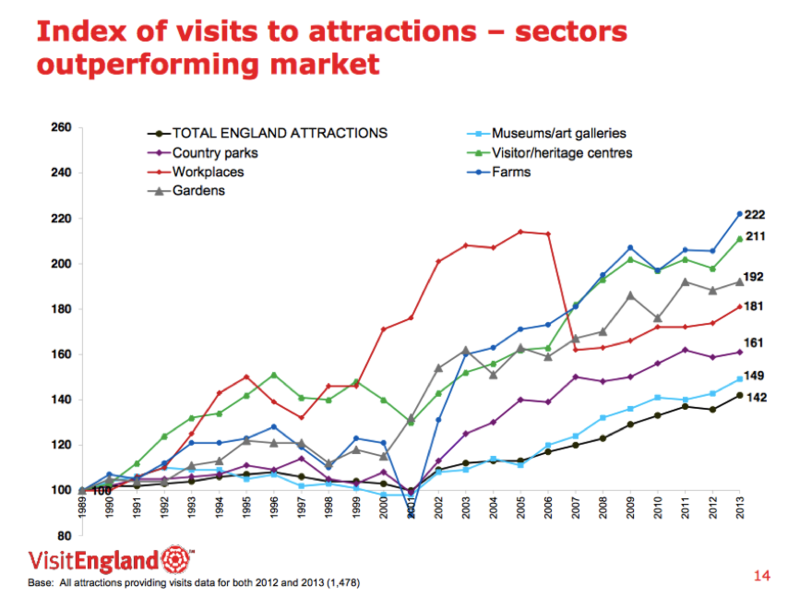 Gardens, farms and heritage/visitor centres have seen extremely strong growth across the whole period since 1989 and have been the best performers. Whilst some AIM members fall into these categories, the report left us wondering if there are things we could be learning from other types of visitor attraction? If you’ve already signed up for AIM Visitor Verdict, we’d like to invite you to attend a free Visitor Verdict workshop on Monday 14th July 2014 to help you get even more out of it. There are limited places available so we recommend registering early. uses Visitor Verdict would be very welcome to register in your place. When you register there will be the opportunity to share examples of current challenges facing your museum. During the workshop we will explore some of these and show you how visitor research and benchmarking can help. We will both be available to talk to in person on the day of the workshop too.